As we reported first earlier this year, Top Gear USA, the twice aborted attempt at colonization by the famous BBC franchise, will hit the history channel this fall. Here are the three hosts. Update! The beloved original Top Gear airs on the BBC2 in Britain with spin-offs in both Australia and Russia, but attempts to bring it to the United States have twice failed. Most recently, NBC announced it was bringing the show to network television and even shot a pilot before cutting the show, reportedly fearful over the failure of Knight Rider. The pilot starred funnyman Adam Carolla, Tanner Foust and Eric Strommer and was apparently so bad it's never been released. 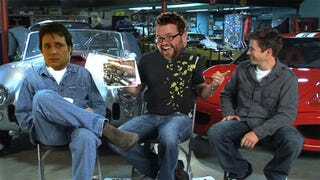 Both Carolla and Strommer were dropped for this most recent version, replacing them with comedian Adam Ferrera and mostly unknown SPEED commentator Rutledge Wood. History committed to ten episodes of the show debuting sometime this fall with production already in motion. A spokeperson for BBC Worldwide Productions, who is co-producing the show, said "Together we have worked to tailor the format for the American audience, while staying true to the original dynamic that fans across the world have come to love." To understand what they've done to "tailor" it to an American audience it's best to look at the two new hosts: one of them is known almost entirely for NASCAR coverage and the other has almost no experience with cars. Detailed bios of the hosts below. It looks like Rutledge Wood is going to be the funny man on Top Gear USA as he's best known for crashing SPEED's NASCAR pre-race show, often reporting from the beer-swilling infield and pulling pranks on drivers. Despite the NASCAR connection, Rutledge has some car guy cred, owning, among others, a 1953 Plymouth Suburban and a 1970 Datsun 240Z. He keeps both on the road himself, often diving for parts in local junkyards. It's a promising start, at least. Rutledge was born in rust-free Arizona, but emigrated to moonshine-friendly Peachtree, GA to attend the University of Georgia. After graduating from there he went to work for Country Music Television and then jumped onto hosting a daily talk show for Clear Channel. Eventually he hooked up with SPEED for the "Need for SPEED Road Tour," which helped move him into the position of an on-air personality. Adam Ferrara has something of a personality disorder when it comes to television experience. He plays Chief "Needles" Nelson, alongside Denis Leary in FX's "Rescue Me," a drama about New York City firefighters, but is also known for his successful standup comedy career, including a Comedy Central special, "Funny As Hell!" He also had a roll in "Paul Blart: Mall Cop" playing Sergeant Howard. But is he a car guy? With Adam Carolla as the comedian host of the last attempt at Top Gear USA it was at least abundantly clear he got cars. Here's what we know: he posted shots of himself posing with cars at the recent New York Auto Show on his twitter feed. He also told Top Gear that the Pagani Zonda F is his favorite car, but we're hopeful that that was just an automatic response to a lame question and that his real automotive taste is much more interesting. We've been through this drill before because Foust has been attached to host this show from the beginning. His best asset is his right foot. Foust has had most of his professional driving success as someone who can control a car at its limit, and then push it even further. That's what he does as a stunt driver, hooning on the sets of productions such as The Bourne Ultimatum, The Fast and the Furious: Tokyo Drift, and The Dukes of Hazard, as well as on various television shows and commercials. He also won a gold medal at the 2007 X-Games Rally and a championship in the 2007 Formula Drift series. He's currently competing in the series with a RWD Scion tC. More recently, Foust co-hosts (or co-hosted?) SPEED's SuperCars Exposed, a program all about fast cars. We last saw him at the Texas Mile racing Paul Tracy in a heavily modified Mustang. While there he hinted he'd like to see how fast he could get our Lincoln MKT press car to go, so there's no doubt he's a bit nuts in way any Top Gear host should be. UPDATE 2 If you want to get a sense of Rutledge Wood's on-air persona here's him trying to eat three pounds of chili cheese fries and a 22-inch hot dog for his segment "Rutledge At Large."